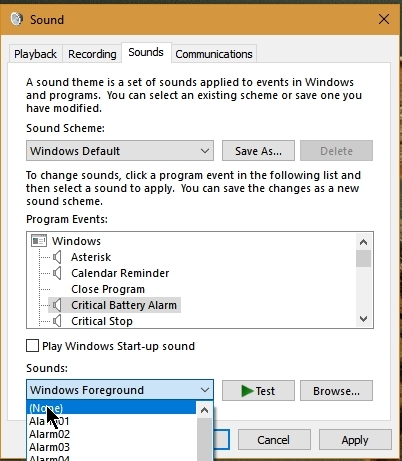 I'm trying to silence a specific sound that Windows 10 makes without cutting out the audio entirely. It's the jingle Windows makes when it tries to warn you about something, or when clicking on something doesn't work. How can I mute just this jingle and nothing else? Have you tried Control panel>Hardware and sound>Change system sounds and then searching for the alerts that use that sound and disabling or changing the sound? The sound I want to silence is highlighted. There doesn't seem to be the option of disabling it, just changing it. Do I have to record silence and then set it to that? I'm not on the computer now, but can't you set it to nothing? I remember seeing that option. Maybe I'm wrong. D'oh! Thanks for pointing that out.